Here's our guide on how you can both use and upgrade the Bow, Light Bowgun, and Heavy Bowgun in Monster Hunter World. 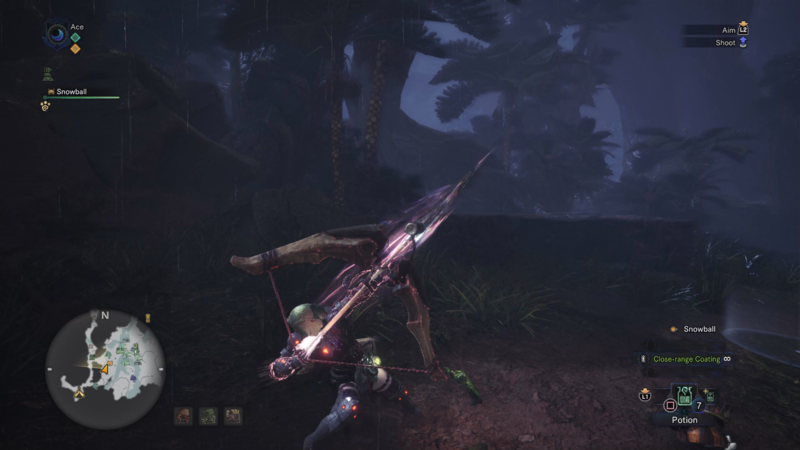 The Monster Hunter World Bow comes in three basic forms: there's a standard bow, a Light Bowgun, and a Heavy Bowgun, all of which have their own unique abilities and benefits. In this Monster Hunter World Bow guide, we'll be walking you through how to use all three types of bows, pointing out the various monsters you want to use each type of ranged weapon against. If you instead need anything else on Monster Hunter World, including how to quickly track down a monster using the Scout Flies, as well as how to safely capture a monster for rare items, make sure to head over to our Monster Hunter World guides walkthrough hub. The three mains ranged weapons of Monster Hunter World are the Bow, Light Bowgun, and Heavy Bowgun. The first of these, the Bow, is your more conventional ranged weapon of choice, able to unleash arrows at monster from both close range and afar. The Bowguns however, specialise in dealing out elemental attacks through a variety of different ammunition types, including poison, paralysis, ice, and blast. The Bow is one of the easier weapon to use in Monster Hunter World - for the more standard of attacks, you only have to pull the left trigger to aim, and press the right trigger to fire. However, if you hold down the right trigger while aiming with the left trigger, you’ll charge up your shot, adding a second, and eventually a third arrow to your shot, meaning you can unleash three arrows at once. But the Bow has an alternate mode of fire. If you simply press B/Circle without aiming, you’ll fire off three arrows in a horizontal line in the direction that you’re facing, meaning the Bow can basically be used as a close range weapon. But if you press B/Circle three times in a row, you’ll fire off two rounds of arrows, followed by shooting up a third attack into the sky, which will cause debris to rain down from the sky in the direction that you’re facing. This is a great attack for when you’re going up against a slow moving monster like the Great Jagras or Barroth, who like to stick around in one place for a while. Finally, you can press Y+B/Triangle+Circle, to fire off a charged shot, while either aiming or free roaming around. Although it takes roughly three full seconds to properly charge up, this shot it devastating if you can land it on the head of a monster, since it’ll almost always stun them. 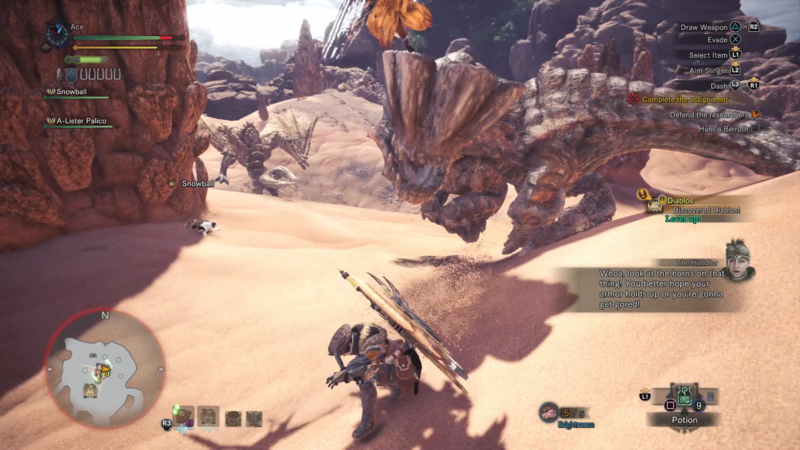 Due to the long charge up time of this special shot, you’ll probably want to use your Palico to distract the monster for a bit, while you get the charged shot ready. The Bowguns in MHW come in two varieties: Light and Heavy. Simply put, the Light Bowgun allows for more movement around the battlefield, while the Heavy Bowgun makes you slower and requires more time to load and fire. Both forms of Bowgun actually draw from the same special ammo pool, so if you use up all your Pierce Ammo while firing the Heavy Bowgun, don’t then expect to be able to find more reserves when you switch to the Light Bowgun back at camp. Both the Light and the Heavy Bowgun weapons are actually really easy to use. Simply select the type of ammo you want to use by pressing up and down on the D-pad, and then fire away by aiming with the left trigger and firing with the right trigger. Unlike the Bow, you can’t fire without aiming with the Bowgun, but you can move around while firing with the Bowgun, unlike the Bow, where you’re stuck in one place while letting off a shot. Since the Bowguns are such versatile weapons, you can basically use them against any beast in Monster Hunter World. From the slow Great Jagras to the agile Legiana, the Light Bowgun and Heavy Bowgun are solid weapons for taking on even the most powerful of monsters. However, we’d recommend bearing in mind the Light Bowgun’s added mobility when selecting either one, as the ability to run while firing with the lighter weapons gives it an added bonus against flying and quick monsters. We might be all done with our guide on the Bow and Bowguns of Monster Hunter World, but why not continue to our additional guides on the complex game, including how to unlock the Zorah Magdaros armor, or how to get to grips with weapon Affinity statistics.